Not even the most rigorous risk assessment can eliminate the potential for disaster. What you can do is prepare: arm your employees with the right equipment and the necessary training (which you can read more about on p.88). Thanks to the easy accessibility and low cost of incredible life-saving innovations like the automatic external defibrillator (AED) and evacuation chair, we can now help save more lives than ever. We believe all businesses should have access to emergency equipment, which is why we’ve sourced the most respected, user-friendly products on the market and made them available to you. After someone suffers a sudden cardiac arrest (SCA) - when the heart stops pumping blood around the body - the first few seconds are critical. Irreparable damage can occur within four to six minutes. The sooner rescuers can administer first aid - including defibrillation, the better the chances are of saving the victim’s life. While there is no legal obligation to have an AED on site, if you don’t, the chances of survival are extremely slim. And remember, SCA can happen to anyone at any time. 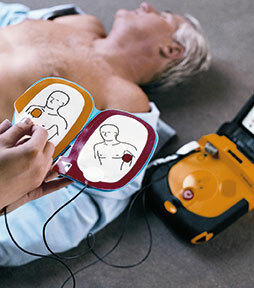 We currently supply two of the top brands in the AED market: LIFEPAK, which is used by 70% of UK ambulances and, as of early 2017, HeartSine, the name behind the world’s first portable, battery-operated defibrillator. Organisations have a legal obligation under the Regulatory Reform (Fire Safety) Order 2005 to make sure everyone on their premises should be able to escape safely in the event of a fire. 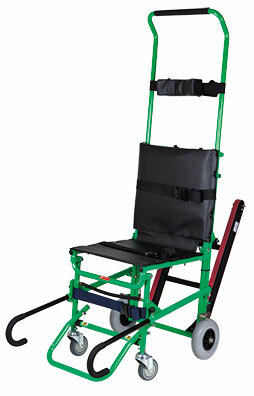 To help you fulfil this requirement, we supply the lightweight, durable EvacuRite, a foldaway evacuation chair that gets people with limited mobility out of danger quickly. Now is the time to invest. Not when it’s too late. We strongly recommend you supplement your purchase of emergency products with appropriate training. Our expert trainers offer engaging, memorable training days when you want, where you want. The aim is to increase skills and confidence when dealing with emergency situations and equipment. To find out what courses are available, please visit the training section of our site.